Filed to: In Russia, Sawzall Cuts YOU!Filed to: In Russia, Sawzall Cuts YOU! In Russia, Sawzall Cuts YOU! Just the thing for hauling your best buddies, livestock, vodka distillery, and Ekranoplan parts! 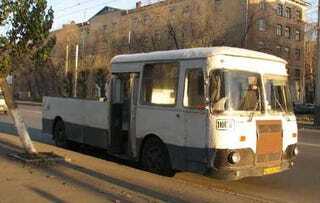 Those resourceful Russians have done it again, this time taking a Soviet-era LIAZ bus and adding a truck bed. Check out the original LIAZ interiors- that was back when men were men and bus seats were steel benches!